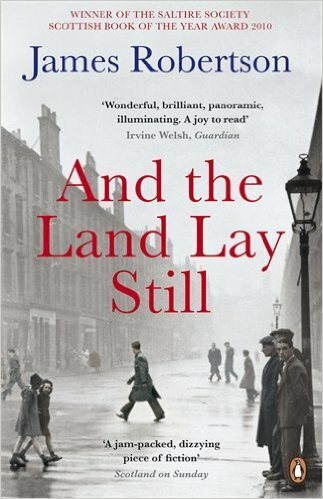 If Lanark was the Scottish novel of the 1980s, James Robertson’s And the Land Lay Still has strong claims to being the definitive novel so far of the twenty-first century. It is a sweeping work, the sort of read which absorbs and challenges, moves and enlightens. Robertson’s canvas is broad, a daring blend of history and fiction: it is nothing less than the history of a nation from the end of the Second World War through to the Labour Party’s General Election victory in 1997 and the gathering momentum for Scottish devolution. All of this is told through a series of interwoven narratives which present the personal histories, tragedies and sometimes triumphs of those involved. Often, the novel’s focus is on fathers and sons, the weight of expectation and the plight of prodigals: Angus Pendreich, a press photographer, and his son Michael; Don Lennie, socialist mechanic, and his errant drug dealing son, Charlie; tartan Tory Sir Malcolm Eddelstane and his son, David. Throughout, Robertson’s goal seems to capture something of the diversity and social change through which Scotland has travelled. We encounter Don and Jack, soldiers emotionally scarred by their experiences in the Far East; Monsieur Lucas, a French teacher settled in Perthshire; Saleem Khan, a highly educated man reduced to the role of shopkeeper; and Mary Murray, who seeks to establish her own independence in a male dominated industry. Members of the gentry at lesser public schools are as much a part of this novel as bright scholarship boys and those lives let down by education. Often it is in the smallest of details which Robertson neatly delineates shifting mores. Often, too, characters conceal hidden lives; it is perhaps no surprise that Robinson’s other novels include a reworking of James Hogg’s Confessions of a Justified Sinner. Geographically this novel is as broad as its sense of history. Many of the stories are based in the neighbouring districts of Fife, Stirlingshire and Perthshire, a neat device which enables Robertson to probe both Highland and Lowland identities, the rural and industrial. Gaels and Glaswegians enter, and the story shifts from Caithness to Edinburgh, and the enigmatic figure of Jean, storyteller, host and witness to history in her Old Town flat, reaching its finale in a booming, cosmopolitan Edinburgh. Indeed, beneath the novel is a concern with the growing move towards independence. The bright and ambitious Peter Croick enters, apparently the ‘real’ James Bond. A failed intelligence officer, Croik lurks on the fringes of Scottish politics, witnessing the gradual shift in Nationalism from proto-Jacobite fantasists to serious political force. This isn’t a novel which wears its politics lightly. Robertson, alongside writing several of the most important recent Scottish novels, also translates into Scots well known children’s books, which perhaps gives a flavour of what’s to come. The poet Hugh Macdairmaid, socialist and nationalist, features. The infamous theft of the Stone of Destiny and its return to Arbroath in 1951 forms part of the mystery. Although Robertson stops just short of polemic, there is much to question: the novel ignores the issue of sectarianism, a terrible blight on Scotland’s largest city, and overlooks, too, the central role of the church not only in the lives of many individuals but also on politics. Let none of that, however, detract. The writing is characterised by a remarkable linguistic diversity, encompassing both Scots and English, and moments of realism, symbolism, poetic insight and satire. And underneath all is a sense of destiny: this is a novel of dreams and hopes and plans and schemes, often failed, but moving forward inexorably. Somehow, amidst the individual messes of repressed lives, broken relationships and family divisions, this is a novel of hope and life.